A photograph of a glass eye from an optician’s case—possibly made by E. Muller of Liverpool. c. 1900. Courtesy of the Wellcome Library, London under a Creative Commons License (Museum No A660037). Published in 1904, H. G. Wells’s novel The Food of the Gods and How it Came to Earth is a tale that depicts ocular prosthesis at its most effective: the minor character Mr. Skinner is only revealed as an artificial eye user after his death, where the only remains of him found are a glass eye and a severed shoulder blade, thus paying testimony to the increasingly life-like nature of contemporary ocular prostheses. Mr.Skinner’s use of such a device is in fact so convincing a replacement that even his wife is said to be unsure of whether he wore an artificial eye. Furthermore, the narrator even suggests that the device enhanced, rather than detracted from, Mr. Skinner’s personal appearance prior to his death, providing a contrast with earlier depictions of ocular prosthesis from nineteenth-century literature, which, in many cases, described artificial eye wearers as having an abhorrent look (see Miss Ruff from Anthony Trollope’s 1859 novel The Bertrams, Mr. Pinto from William Makepeace Thackeray’s 1862 short story“The Notch on the Ax: A Story a la Mode” and M. Laferté from George du Maurier’s 1897 novel The Martian). Written following a number of significant improvements made in both the prosthetic devices that were available to the one-eyed and the surgical procedures that prepared the ocular cavity for the introduction of an artificial device, Wells’s text showcases an artificial eye which successfully negates the unwanted attention and stigma so often attached to earlier prosthesis users. Many technological and medical developments facilitated this ability in real life, including Amédée Bonnet’s re-description of the tenon’s capsule in 1841, which paved the way for surgeon’s to more safely remove eyeballs using a procedure called enucleation; the influence of French ocularist Auguste Boissonneau’s personalised and anatomically-accurate approach to prosthesis making; the development of new lighter and more durable glass compounds by German ocularists in the 1870s; and the Müller brothers’ invention of the “Snellen” or “reform eye” in the 1890s, which provided enucleated patients with a prosthetic device that could both fill the empty socket left following enucleation and enable a full range of natural movement. 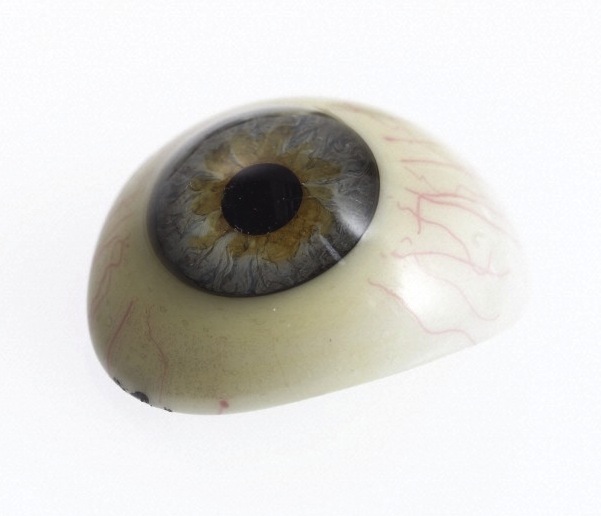 Through his portrayal of a device which utterly evades attention until it is detached from the socket of its user, Wells presents ocular prosthesis as a technology that (thanks to its development in the nineteenth century) could successfully hide the one-eyed user in early-Edwardian society. Many weeks after, amidst the charred ruins of the Experimental Farm, there was found something which may or may not have been a human shoulder-blade and in another part of the ruins a long bone greatly gnawed and equally doubtful. Near the stile going up towards Eyebright there was found a glass eye, and many people discovered thereupon that Skinner owed much of his personal charm to such a possession. It stared out upon the world with that same inevitable effect of detachment, that same severe melancholy that had been the redemption of his else worldly countenance. The glass eye of course has an air of extreme conviction, but If It really is Skinner's—and even Mrs. Skinner did not certainly know if that immobile eye of his was glass—something has changed it from a liquid brown to a serene and confident blue. That shoulder-blade is an extremely doubtful document, and I would like to put it side by side with the gnawed scapulaeof a few of the commoner domestic animals before I admitted its humanity. Scapulae is an anatomical term that refers to the shoulder blade. Wells, H. G. The Food of The Gods and How it Came to Earth. 1904. rpt. London: Thomas Nelson and Sons, 1909. Pages 50-1. Full text available online at archive.org. The College of Optometrists, “Glass Eyes”. Ott, Katherine. “Hard Wear and Soft Tissue: Craft and Commerce in Artificial Eyes”. Artificial Parts, Practical Lives: Modern Histories of Prosthetics. eds. Katherine Ott, David Serlin and Stephen Mihm. New York: New York UP, 2002. 147-71. Prince, J. H. Ocular Prosthesis. Edinburgh: E. & S. Livingstone, 1946. Wells, H. G., “The Food of the Gods and How it Came to Earth,” Nineteenth-Century Disability: Cultures & Contexts, accessed April 23, 2019, http://nineteenthcenturydisability.org/items/show/15.